The growth behavior and electronic properties of the lowest energy structures of neutral LaSin (n = 6–20) and their anions were explored by means of the ABCluster global structure searching strategy combined with the mPW2PLYP double-hybrid density functional. 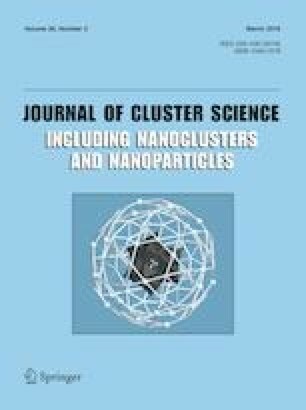 The results revealed that the growth behavior of the lowest energy structures of anionic LaSi n − (n = 10–20) clusters choose La-linked two silicon subclusters to La-encapsulated in silicon cages. For neutral LaSin (n = 6–20), the growth behavior of the lowest energy structures from substitutional structure to linked motifs and finally to encapsulated configurations occurs at n = 14 and 20, respectively. The simulated photoelectron spectroscopy, adiabatic electron affinities, vertical detachment energies, relative stability and HOMO–LUMO energy gaps were presented. Analyses of HOMO–LUMO energy gaps, relative stability, and chemical bonding reveal that the LaSi20− possesses ideal thermodynamic and chemical stability in a high Ih-symmetry endohedral motif, which can turn it into suitable constitutional units for cluster-assembled nanomaterials. The online version of this article ( https://doi.org/10.1007/s10876-019-01541-8) contains supplementary material, which is available to authorized users. This work was supported by the National Natural Science Foundation of China (Grant Nos. 21863007 and 21263010), by Program for Innovative Research Team in Universities of Inner Mongolia Autonomous Region (Gran No. NMGIRT-A1603), and by Natural Science Foundation of Inner Mongolia (Grant No. 2016MS0307).